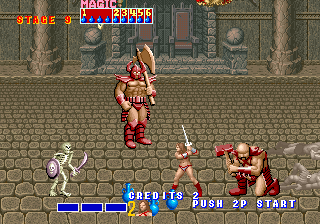 OK, I decided to do a review of this today, simply because I recently obtained the Platinuminary Trophy on the PS3 Megadrive Games Compilation, which obviously included their famous coin-op conversion, Golden Axe. I'm not going to review the Megadrive conversion, simply because the Arcade game was far superior. Not to say the home conversion was awful, but believe me, you would notice the difference. Anyway. Golden Axe tells the story of three warriors, all of whom have lost family at the hands of the evil "Death Adder". I say 3 warriors, but obviously you can only take a maximum of 2 through the game... so one of them's going to have to do without the pleasure of revenge. Ah, well. 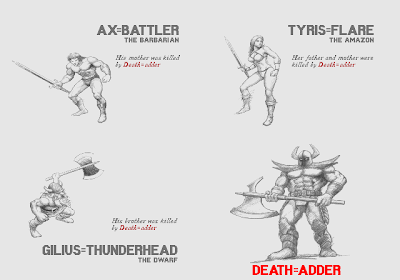 Your three warriors are a varied bunch, there's Ax Battler the Barbarian, whose sword has a reasonable reach, can move round the screen at a reasonable pace, and possesses reasonable magic skills. All in all, he's a pretty average, reasonable character to play with. Feminists can rejoice, however, as Tyris Flare, the Amazon, balances up the gender differences with her puny little sword, fast attacks and most powerful magic. Luckily there's something for the vertically-challenged too as Gilius Thunderhead, the Dwarf, boasts the longest weapon (oo-er), but the weakest magic. The main gameplay is pretty similar to Double Dragon, to be fair, it's a side-scrolling beat/slash-em 'up with bells on. The game begins as one of your friends staggers across the screen, injured, only to be attacked from behind by a typical enemy grunt. As he dies, you take up the rather lop-sided battle to avenge him and your family members. Luckily, you've got health, magic and your own player skill on your side as the game's AI starts off pretty sloppy, but later on in the game you'll find yourself struggling to beat some of the game's tougher enemies. You do have a wide range of attacks to use, though. Tapping the attack button will start a combination slash attack that can end in a variety of ways, either smacking the enemy's head a few times, giving them a swift kick, or even hoisting them up on your shoulder and throwing them to the side. Using the jump button will allow you to make mid-air slash attacks, and you can also double-tap a direction to charge across the screen and launch a shoulder barge or charging headbutt attack. Combining a dash with a jump can also unleash a downward-stabbing attack that can kill some weaker enemies with a single hit. Pressing the attack and jump buttons simultaneously will cause you to attack behind you, either with a sword-twirl or a roll and a swing of the axe in the case of Gilius Thunderhead. 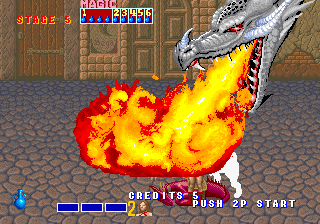 The most impressive part of the game had to be the magic attacks, however. Ax Battler summons the power of the Earth in the form of Volcanos, Gilius Thunderhead commands the power of Lightning (Who saw that one coming?? ), and Tyris Flare, without wanting to be too obvious, pulls forth the infernal fires of Hell. Or something like that. In fact, the main reason for choosing Tyris at the character select screen was to see her magic in action, as hers was both the most powerful and the most impressive. Whilst Ax's huge volcanic eruption was good (when magic was full), Tyris could summon lots of small fires, a couple of swooping fire elementals, or even bring down a huge fire-breathing dragon with maximum magic power. Yes, I would save my magic potions up just to see that. Enemies, then... they range from the usual enemy grunts and skeletons, to huge giants and armoured foes and of course the token female enemies who are generally considerably weaker but faster, as seems to be usual in this genre. Magic can be gained (and stolen) when you encounter the little blue elves, and green elves carry food for health. Between levels you are often surprised by a couple of these while resting. You have only seconds to attempt to get as much inventory from them as you can. The levels themselves are ingenious, ranging from the "Turtle Village" (yes, a village on the back of a giant turtle) to the fight on the back of an eagle. Honestly. Other than that... there's really only the Bizarrians left to mention. Y'see, a staple of beat 'em-ups was that you could pick up weapons to use against the enemy. It's one of those rules, I guess, that there has to be weapons of some kind. But in this game, you already have a weapon, and it appears to be glued to your hands and unreleasable (except that you are apparently ambidextrous and swap hands according to which direction you're facing... d'oh). The addition of magic wasn't enough, so instead they added dragon-like creatures you can ride on. They come in 3 flavours, there's the "Chicken Leg" one which knocks enemies down with a sweep of its tail, the blue one which gives a short range blast of fire onto the ground, and the best of the lot is the red one, which will breathe a fireball that will travel the full length of the screen. Unfortunately it's also the rarest of the lot, but it makes one of the boss battles in particular a very easy one. The game was, as I said, converted with great success (and alterations) to the Megadrive with the loss of graphical detail, but unfortunately a series of comparitively CRAP sequels followed. 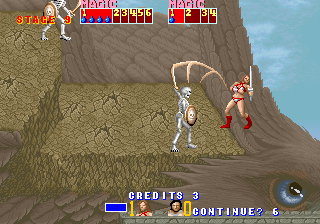 With good reason, Golden Axe was very popular in arcades. It's a smooth, fluid, brutal game with a fair degree of fun and with excellent graphics for the time. Don't waste your time with the console sequels, I only played them to get the aforementioned Platinuminary trophy... and I didn't enjoy it. Grr. I fell in love with this after playing it while waiting for my uncle's plane at Birmingham Airport. I coveted the home version from that day, and one birthday, my Mum bought the Atari ST version for me. Looking back now, the conversion leaves a lot to be desired, but to me at that time it was gaming perfection, and one of the first games I ever completed. Thanks for the trip down memory lane!